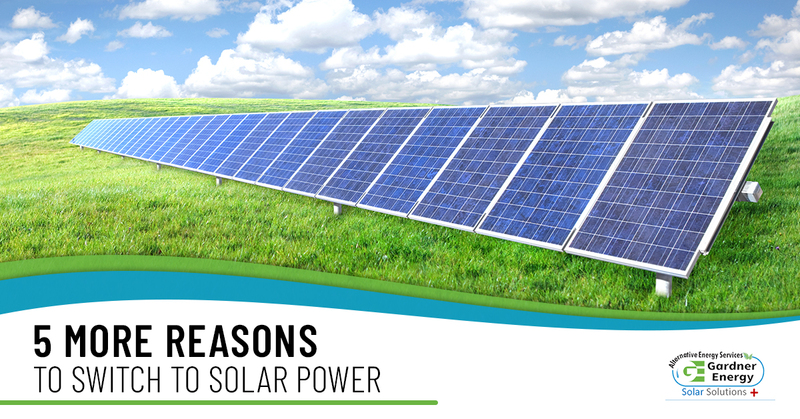 In our last blog, Gardner Energy gave you five reasons to switch to solar power. But we couldn’t help ourselves — there are just so many great reasons to switch that we thought we’d provide you with five more! If you weren’t convinced by our reasons in our last blog, here are five more reasons you should switch to solar power. Switching to an alternative energy source is as simple as contacting us for our solar panel installation services. Over the last 10 years, utility rates in Davis and the rest of the country have steadily increased. In many places, the price of residential electricity has gone up by an average of three percent annually. This may not sound like a lot, but these rising costs can stack up quickly. Arranging for solar panel installation to be carried out on your home can help you fix these energy rates. This will save you money in the long run, as your neighbors who aren’t relying on a solar system for their electricity will be at the mercy of the utility company. Are you tired of paying your utility company for your electricity every month? In some states, the Renewable Portfolio Standard requires that a power company gets a certain percentage of their electricity from an alternative energy source. That means that they have to find solar panel systems that are producing more energy than a home or business needs, and buy the extra energy from them. This solar energy can be sold at a premium, and you’ll quickly find that the power company is paying you! If that’s not a great return on investment, then we don’t know what is. By now, nearly everyone acknowledges that using fossil fuels to support our lifestyles just isn’t sustainable. It’s bad for the environment, it’s bad for your health, and it’s bad for your wallet. The future belongs to solar panels and alternative energy source systems. People recognize this, and they’re starting to act. In 2016, the majority of the additions to the nation’s power grids were solar and alternative energy systems. By working with the solar panel installation experts at Gardner Energy, you can be a role model in your community and lead the charge against non-renewable energy usage. It’s a common myth that if the sun goes down, or is covered by clouds, you can’t use your solar energy. This isn’t true. Thanks to solar batteries attached to your panels, you can store energy for cloudy days and for use at night. You’ll never have your supply of energy interrupted. The process of solar panel installation is sure to keep you cool. Not only will you have a great new accessory for your home, but you’ll also notice a decrease in the temperature of your home. The solar panels act as a giant sun shade on your roof, which will block the amount of sun that warms your living spaces. This same sunlight then powers your home. It’s a win-win. Gardner Energy has been serving Davis and the rest of Utah for more than a decade. Find out why we are the region’s preferred solar panel installation company. Contact us today and ask about our financing options that make your investment even smarter. ©2018 Gardner Energy - Do not copy. All rights reserved.